All images by Neal Auch. Used with permission. Thought-provoking photography projects also tend to be bold and disruptive, and this work of Canadian photographer Neal Auch certainly fits the bill. 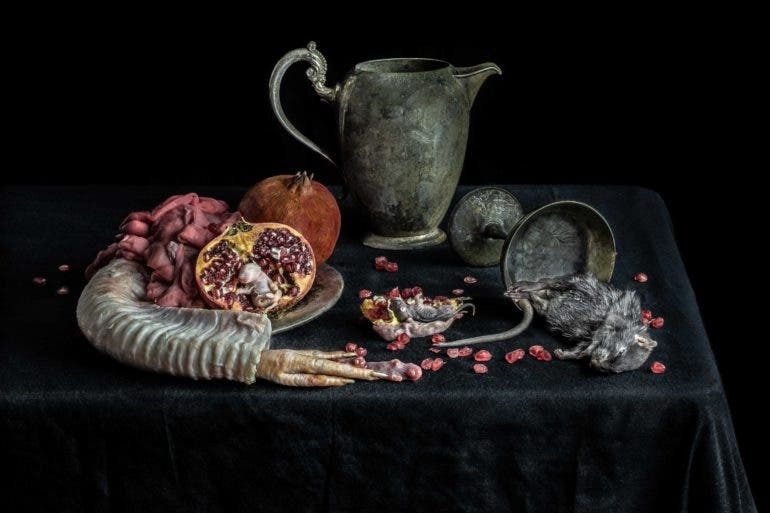 By combining conceptual photography with the styling of 17th century Dutch still life painting, he makes a strong case for his ideas on mortality. He describes his work as seeking to “engage with mortality headlong and encourages reflection on the fragility of life” done in the age-old tradition of memento mori. While death and mortality are some of the most widely explored topics in various creative disciplines, we don’t always see them interpreted as both beautiful and macabre. In this body of work, art, philosophy, and sentiment converge to inspire us to confront the fragility of life in imagery we most likely have never imagined. 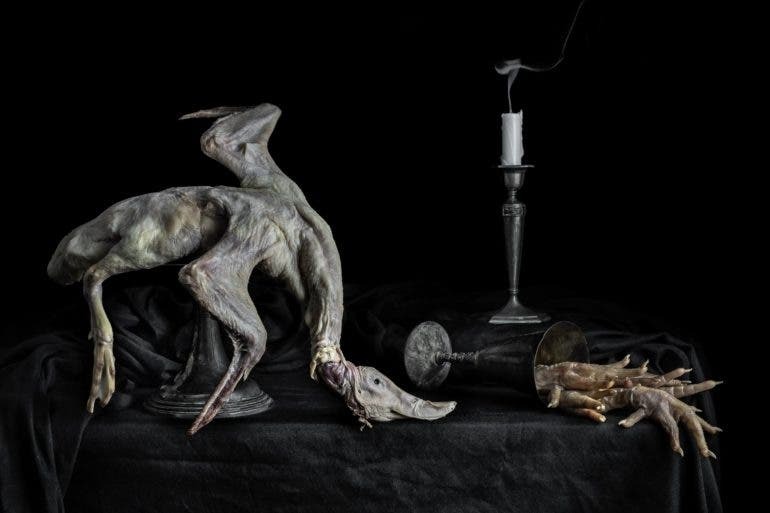 A vanitas style still life arrangement with dead duck, chicken feet, and extinguished candle. The piece serves as a reflection on human mortality and the transience of all things. Describe yourself as a photographer. 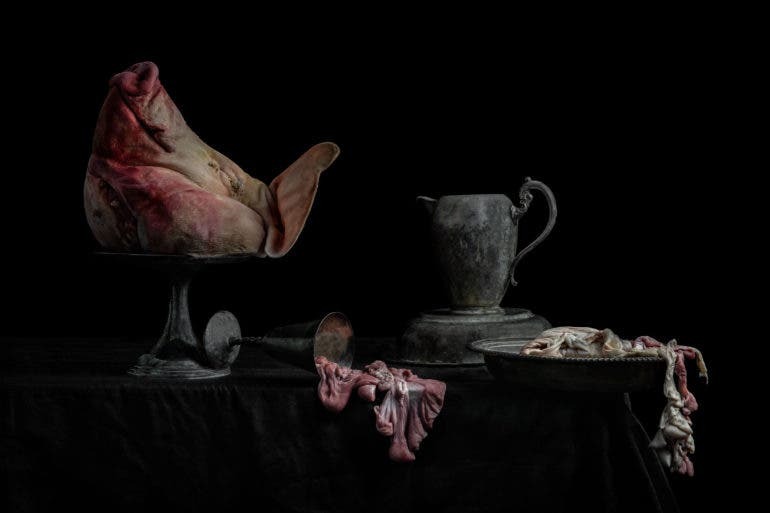 I’m a Canadian photographer working primarily with arrangements of dead animal parts loosely styled after 17th century Dutch still life paintings. My work is very much influenced by the idea of memento mori (the medieval practice of reflecting on the certainty of death). 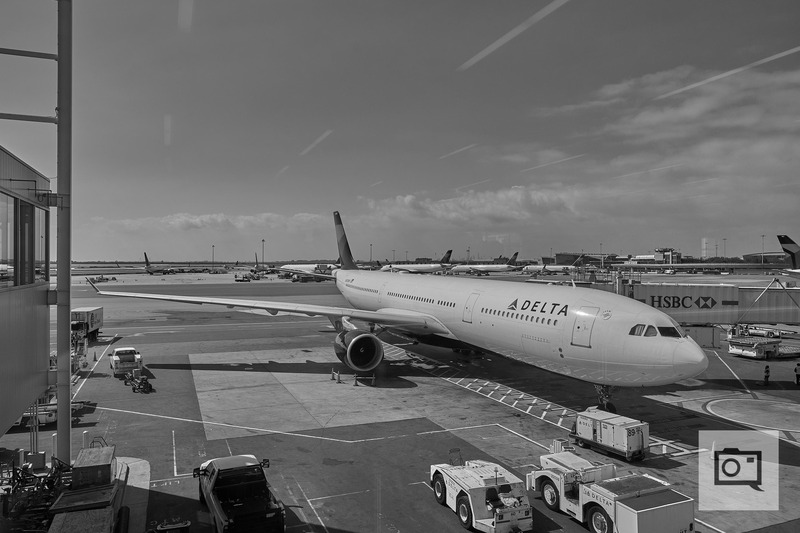 Why did you get into photography? How long have you been shooting? What made you want to get into your genre? My artistic interests are fairly broad and I’ve dabbled in various media and genres over the years, including excursions into visual art, experimental music, and transgressive literature. I adopted photography as a primary creative outlet around 2015 because it felt like the most natural outlet for my creative urges. My photography ended up gaining more traction than any of my previous artistic endeavors and so I happily moved into doing photography full time. At the moment I’m mostly focused on still life photography, although I’ve also dabbled in macro abstraction and portraiture. A still life composition with pig foot and intestines. 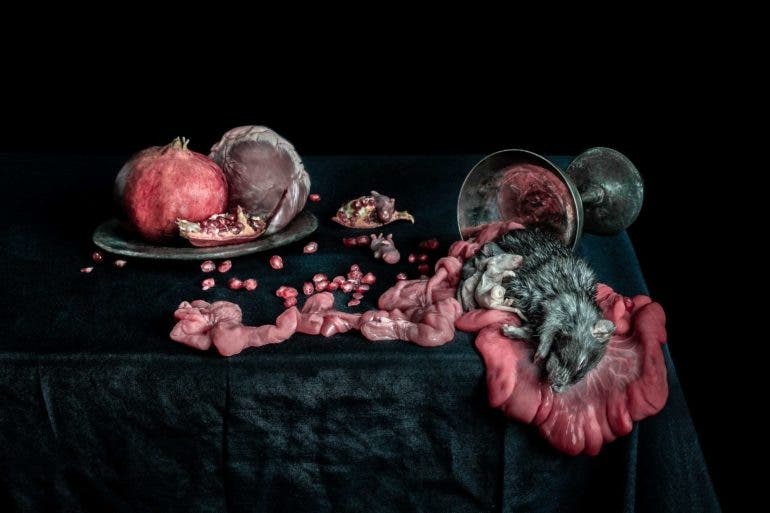 A macabre still life arrangment of pomegranates, silverware, dead mice (both fetal and adult), and various organ meats. Tell us about the project that you’re pitching, or your portfolio. The only certainty in life is that, eventually, it will end. Awareness of mortality is arguably at the very core of what it means to be human; death is the “worm at the core,“ as William James put it. In spite of the centrality of death to the human condition, much of our contemporary discourse around the subject seems polarized between sensationalism and silence. My work seeks to engage with mortality headlong and encourages reflection on the fragility of life, following from the long tradition of memento mori (Latin: “remember to die”) in art and philosophy. All still life compositions include, to some extent, a lament about the transience of all things. While those old 17th century “Golden Age” Dutch paintings of flowers and fruit baskets can look quaint by contemporary standards, viewers at the time would have understood such works as a reminder that life, like the fruit and the flowers, will soon be gone. 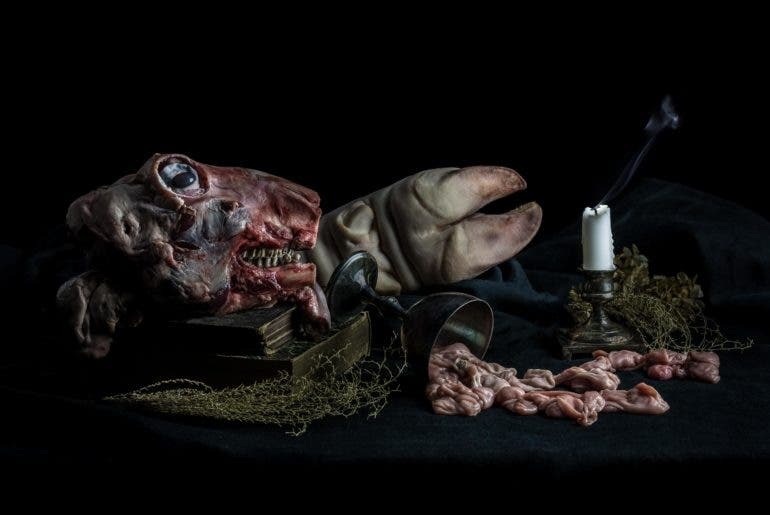 My own still life works are based around the idea of blending iconography of 17th century Dutch still life paintings with my own horror-film-inspired visual aesthetic. 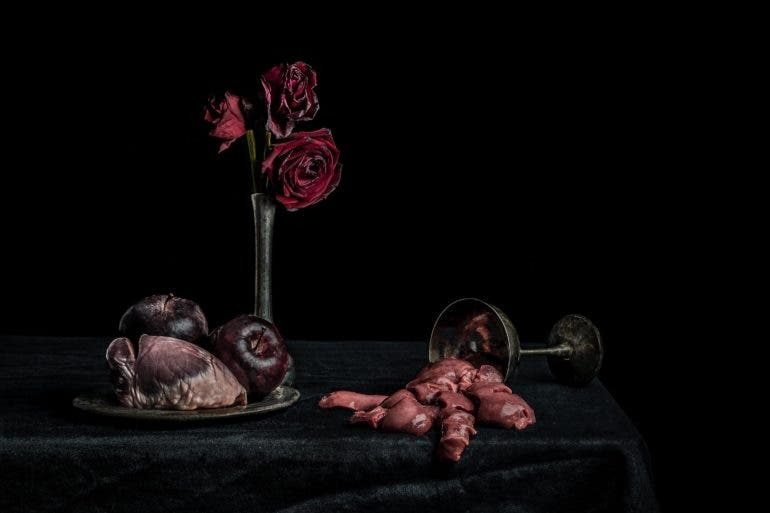 A macabre still life arrangment with apples and organ meats. 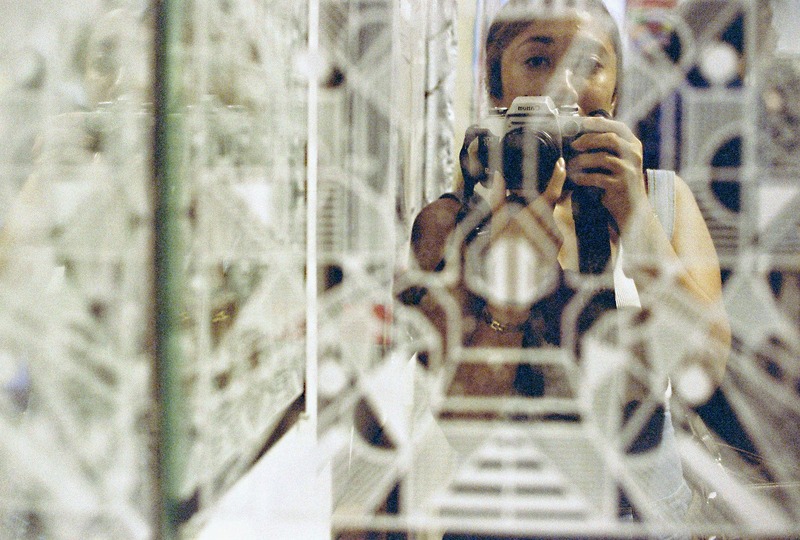 Tell us about your creative vision when you create and take photos, and your processes both mentally and mechanically. What’s typically going through your mind when you create images? In my work I’m very interested in appropriating the key iconographic elements of still life and memento mori art, while presenting these in a more macabre and confrontational manner. So most of the visual motifs that show up in my work are borrowed directly from the history of still life painting. Meat, fruit and flowers are, of course, common subjects for still life composition and these are usually understood as a reminder of the transience of earthly pleasures and inevitability of decay. Extinguished candles and tipped over cups also show up frequently in my work and in the history of still life; these are often understood as metaphors for the fragility of life. Nearly all the key elements of my compositions can be understood in this way, from the more obvious metaphors for transience (clocks, soap bubbles, broken dishes, religious objects, etc.) to the more esoteric motifs (peeled lemons, for example). What photographers are your biggest influences? I’m a huge fan of Diane Arbus, Anders Petersen, Andres Serrano, Joel-Peter Witkin, and many others photographers. However, I practical terms I probably draw more inspiration from painters than I do from other photographers. In particular Claesz, Goya, Caravaggio, Bosh, and Gericault have all been hugely influential for me. 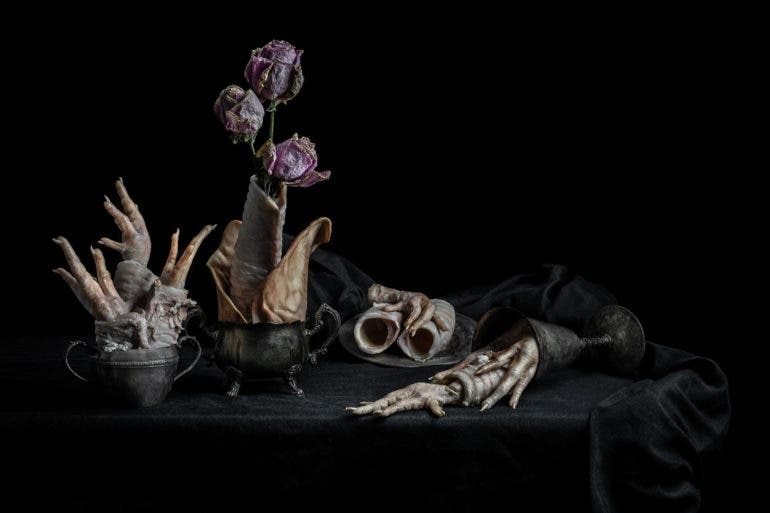 A floral arrangmement constructed from cow trachae and chicken feet, composed in the style of classical still life paintings and memento mori art pieces. 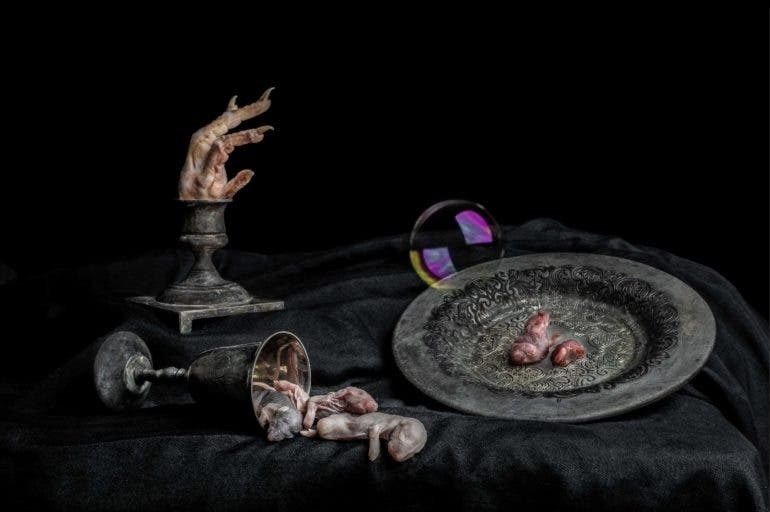 A vanitas still life arrangement with soap bubbles, chicken feet, and other dead flesh. The image functions as a memento mori art piece, reminding the viewer that the pleasures of life, like the beauty of the soap bubble, is shortlived. Want to walk us through your processing techniques? My post-processing workflow involves a combination of Lightroom and Photoshop that is pretty typical of how most digital photographers operate. I do spend a lot of time dodging and burning to try and enhance the “painterly” lighting quality that I associate with still life. But in general I don’t think that there’s anything particularly novel or unorthodox about my processing techniques. Tell us a bit about the gear you use and how you feel it helps you achieve your creative vision. One of the nice things about still life photography is that it makes only modest demands in terms of gear. For this project I work almost exclusively with a Nikon DSLR, a 35mm lens, and two lights (with soft boxes as a primary modifier). Personally, I’m not terribly focused on gear or any of the technical stuff; I spend much more time thinking about atmosphere and metaphor than I do worrying about ISO noise and diffraction. 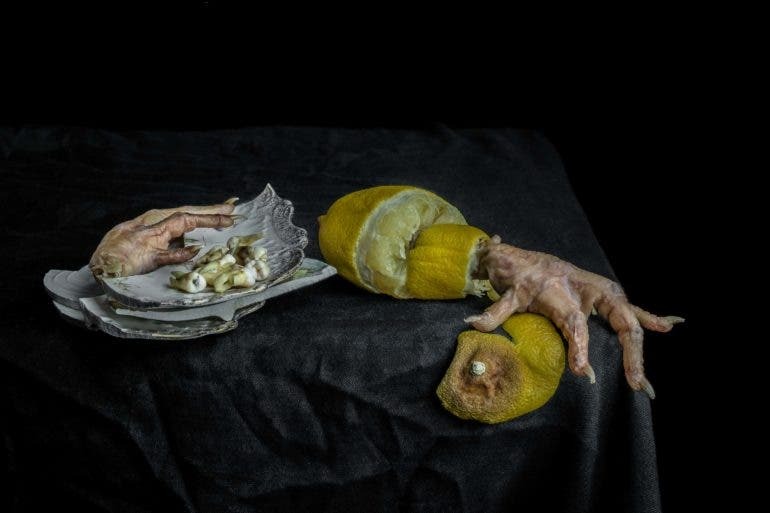 A macabre still life arrangement with peeled lemon and assorted dead animal organs. This piece draws inspiration from 17th century Dutch vanitas compositions and is intended as a meditation on the certainty of death and the transience of all things. 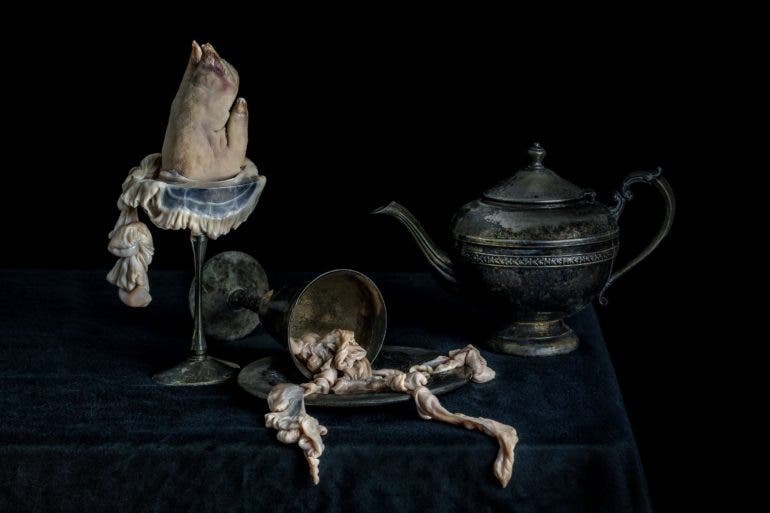 A vanitas still life composition with severed pig head and assorted pig organs. The pieces is indended as a memento mori art piece and might serve as a reminder of the transience of all things. Do you feel you’re more of a creator or a documenter? Why? I think that the distinction between these two modes of photography is that the former is all about building an image up from a blank canvas (analogous to how a painter works), whereas the latter is more about stripping away the inessential to reveal the core meaning of a scene. In this framing I am definitely more of a creator than a documenter; my creative process when shooting still life is very much constructive. I always begin with the camera on a tripod pointing an an empty table and, from there, I gradually build up the composition bit-by-bit, adjusting and tweaking as I go. 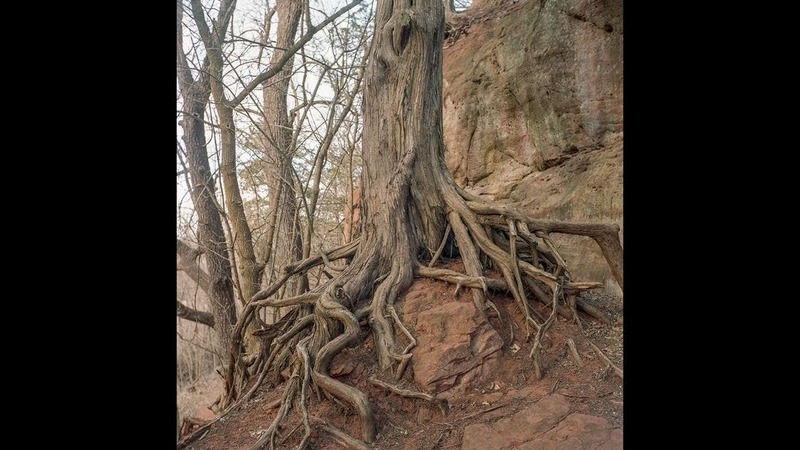 Don’t forget to visit Neal Auch’s website to see more of his work.